Since the Skirball Cultural Center opened its doors in 1996, it has become one of Los Angeles most sought-after event spaces. Nestled in the beautiful Santa Monica Mountains, it was designed by Israeli-born architect Moshe Safdie and named for its philanthropist couple, Jack and Audrey Skirball. Combining spectacular landscaped gardens, spacious courtyards and luxurious ballrooms, this Jewish heritage institution opens its doors to couples of all beliefs and faiths. 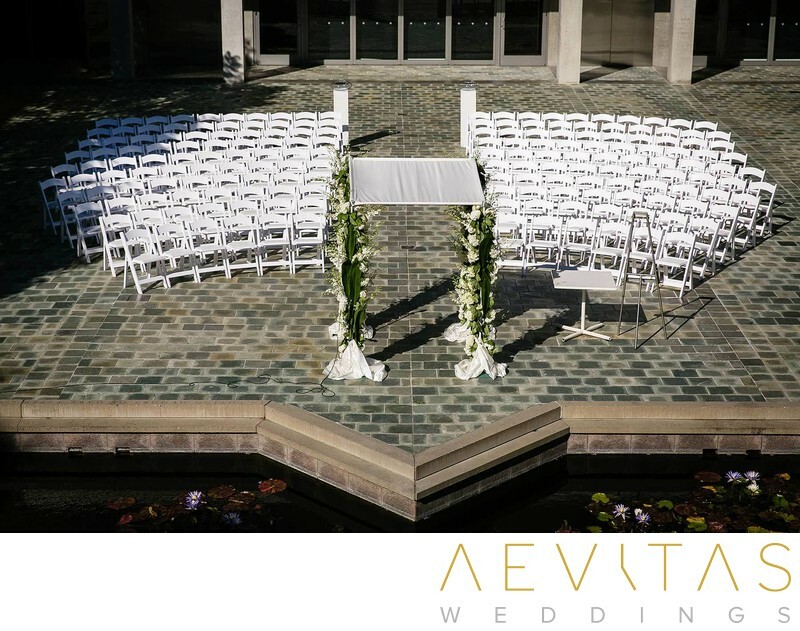 Wedding ceremonies can be held within the Skirball Cultural Center’s immense courtyard, backed by a tranquil lily pond and surrounded by the center’s modern architectural lines. The design allows for an extended entrance procession by the bride, walking around the edge of the courtyard and down to the altar where her groom awaits. The multi-tiered architecture enables your wedding photographer to utilize multiple vantage points, resulting in creative photos capturing each and every moment as you exchange vows. Receptions can be held indoors within the Skirball Cultural Center’s lavish ballroom, with a ceiling that has to be seen to be believed. The neutral colors enable couples to design and decorate the space as they wish, with designer tableware supplied to complement your choice. Dramatic lighting and state-of-the-art audio-visual equipment are also provided, and there is a spacious dance floor for you and your wedding guests to party well into the night. If you prefer an al fresco setting, then the Skirball Cultural Center can also arrange a romantic, candle-lit dinner beneath the stars within the ceremonial courtyard. Gourmet catering is provided by their on-site team, and full bar services are available as part of wedding day packages. Their team of event organizers are available to help you plan your dream wedding event and their highly experienced staff will be at your and your guests service throughout your wedding day. There are rooms available at the Skirball Cultural Center for both the bride and groom to get ready, or the nearby Luxe Sunset Hotel provides beautifully-lit, spacious suites where you can spend an indulgent wedding weekend.